Time Management Training Materials are designed for training employees how to use time management to get organized for peak performance. Train supervisors and staff the power of change, planning tips and tricks, how to manage a workload, organization techniques and more! Seeing is Believing This sample manual to teach Time Management: Get Organized for Peak Performance is in MS Word format. In order to manage time effectively, we have to be able to look at everything, from e-mail, to the way our office is arranged, to our routines and what we do during the day and where our time sinks are. Simply beginning to use a calendar won’t work, nor will writing down a list of things and then never looking at it again; effective time management training involves organization, understanding the importance of goals, and developing plans to take control of your time! For trainers who need a complete, straightforward way to teach time management to their students, Velsoft’s training material is an ideal package that offers a full day of time management training that leads to peak performance. 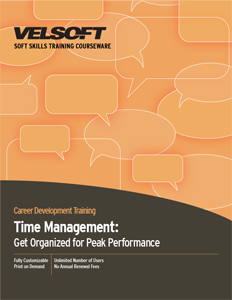 Time Management: Get Organized for Peak Performance training material puts practice into action as students learn simple time management tools that lead to huge results. Velsoft’s courseware is completely customizable for instructors, includes training activities, an instructor’s guide, pre and post-course assessments for students, and more. Save a bundle! Get the Career Development Training Bundle! Take advantage of creating a blended-learning eniroment by combing instructor-led training with Velsoft’s eLearning solution! Want to see the topics you will cover in this course? Check out the Time Management Course Outline.